With contract manufacturing of konjac sponge, our company has to respond quickly correspondence also small lot. Production volume exceeded 450 million units since its inception total, this year we expect the production of about 70 million units. 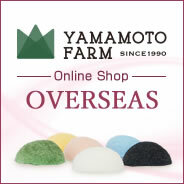 Yamamoto Farm is a manufacturer of Konjac Sponge & Puff facial cleansing products made from konjac plants. Primarily as an OEM manufacturer, the company makes the products in a dedicated factory with domestically-produced materials. The Konjac Sponge has a history spanning over 120 years, originally used to give newborn babies their first baths. It has been used regularly for a long time now as a natural sponge to gently cleanse the skin.